Collins Booksellers - Edward Eberstadt & Sons by Michael Vinson, 9780806157092. Buy this book online. An unlikely bookseller in New York City became the leading dealer in rare Western Americana for most of the twentieth century. After working in western-U.S. and South American gold mines at the turn of the twentieth century, Edward Eberstadt (1883–1958) returned to his home in New York City in 1907. Through luck and happenstance, he purchased an old book for fifty cents that turned out to be a rare sixteenth-century Mexican imprint. From this bit of serendipity, Eberstadt quickly became one of the leading western Americana rare book dealers. 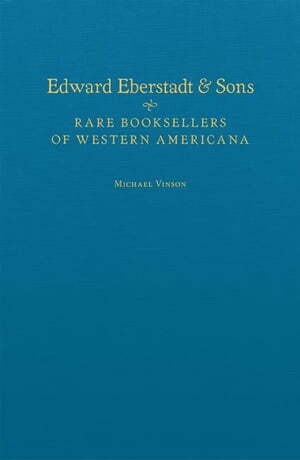 In this book Michael Vinson tells the story of how Edward Eberstadt & Sons developed its legendary book collection, which formed the backbone of many of today’s top western Americana archives. Although the firm’s business records have not survived, Edward and his sons, Charles and Lindley, were all prodigious letter writers, and nearly every collector kept his or her correspondence. Drawing upon these letters and on his own extensive experience in the rare book trade, Vinson gives the reader a vivid sense of how the commerce in rare books and manuscripts unfolded during the era of the Eberstadts, particularly in the relationships between dealers and customers. He explores the backstory that scholars of art history and museology have pursued in recent decades: the assembling of cultural treasures, their organization for use, and the establishment of institutions to support that use. His work describes the important role this key bookselling firm played in the western Americana trade from the early 1900s to Eberstadt & Sons’ dissolution in 1975.